Dr. Rockwell-Evans approaches clients with the warmth, sensitivity, and understanding gained from 20 years of specializing in treating individuals with anxiety and OCD. 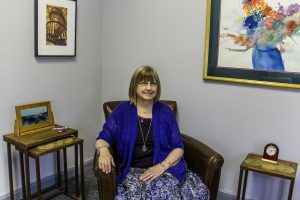 An expert in anxiety and OCD, she has extensive training in state-of-the-art techniques that have been proven most successful in treating anxiety disorders. By working with a specialist in anxiety, you will find the support and guidance you have been seeking to overcome your anxiety and live the life you desire. Dr. Rockwell-Evans holds a PhD in Sociology and Social Work, with an emphasis on the family life cycle and mental health, as well as Masters degrees in Applied Cognition and Neuroscience, Counseling, and Applied Music (flute). In addition to being a Licensed Professional Counselor, she is also a Licensed Marriage and Family Therapist; enabling her to teach your loved ones strategies in how best to support you in your therapy. With expertise in cognitive behavioral therapy (CBT), exposure and response prevention therapy (ERP), and acceptance and commitment therapy (ACT), she works collaboratively with you to identify your values and concerns, and tailors a treatment plan to bring about improvement as quickly as possible. These treatments will teach you tools to develop a different perspective on the thoughts and feelings that create anxiety. Exposure therapy is used to gradually and systematically enable you to confront the fears that cause you to avoid activities and relationships that are important to you. You will learn to relate to your unwanted thoughts and feelings in a different way, enabling you to live the life you want. If you are suffering from crippling anxiety, worry, obsessive thoughts or panic attacks, Dr. Rockwell-Evans can help you move toward the life you want to live. With a compassionate hand, she teaches you coping techniques that allow you to successfully weather life’s ups and downs.